Construction complete. Quick Move In Available! The Che Bella Villas community in Chandler features 60 brand new units all nestled in a gated community. Complete with pool, spa, fitness center, putting green, ramada’s and barbies! 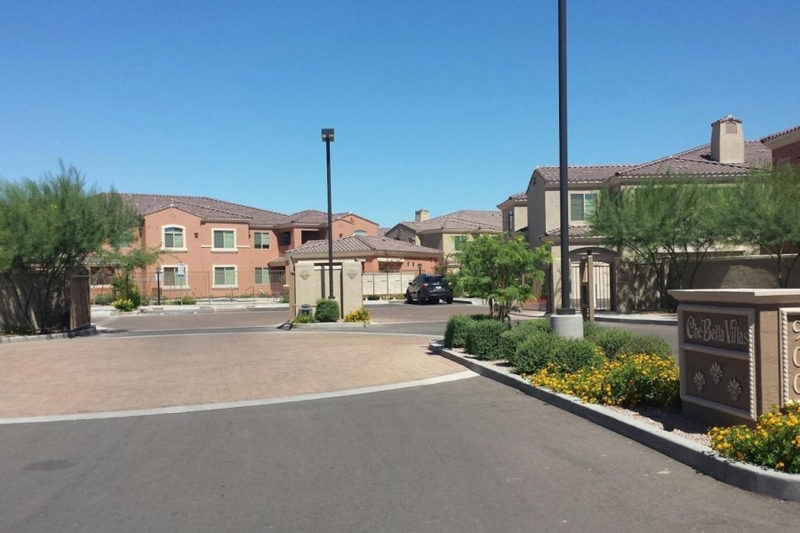 Location: Close to the San Tan freeway, and near the heart of the east valley’s tech corridor. For buyers who want the best of all possible worlds, this could be the answer: a spacious home with a patio along quiet tree-lined community walkways, a short walk from your home to major shopping and businesses, with transportation connections just around the corner.Residences are designed with enough space for comfortable living. Ceiling heights are an expansive nine feet. The Master suite is privately separated from other rooms and offers a retreat with his and hers sinks and cabinets, generous walk-in closets, linen closet and efficient designed gourmet kitchen with the latest kitchen appliances, adjacent to the kitchen is a separate laundry room.While the area abounds with quiet solitude, each villa resident enjoys a private entrance through the front door or through attached garages with an abundance of guest parking. Fabulous landscaped scenic park-like, amenity-rich grounds traverse the entire community as a centerpiece setting for beauty.